Instruction is given on the various durability factors and other characteristics, such as the dangers of cleavage, of diamonds and other gemstones in preparation for diamond setting. The techniques of undercutting a bearing into each prong and tightening the gemstone vectorally is demonstrated and accomplished by each student (prongs are dressed with cup burs or split prong). How to design the graver to fit the individual student's hand is demonstrated. Sharpening and polishing procedures are done by the students in preparation for diamond setting and bright cutting. Students cut a seat in a flat top setting, set stones by raising beads and form beads with beading tools. They also "work-up" beads over worn beads plus 'build-up" (karat gold beads) over worn beads. Students practice star bright cutting and bead set to tighten a gemstone. Bur undercutting with a bearing bur, several stones are set together in a "cluster" setting. 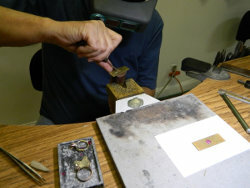 The students learn to set a gemstone in a bar setting using the setting bur and undercut methods. The students create a single and triple bead-set block bright cut by making "relief cuts" and bright cutting the panel walls at a 45 degree angle. 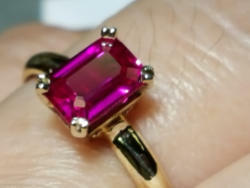 Students set a 1.00 ct. cubic zirconia in a six prong setting. How to undercut, set and burnish (to tighten) channel set gemstones is taught and practiced by students. Instructions given on sizing and re-shouldering a channel set eternity ring. 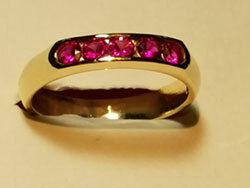 Students cut a bearing in a tube and burnish in a gemstone. Instruction is given on re shouldering a worn tube. Students cut a bearing and tighten gemstone in setting by spin method. The students "hammer set" or burnish a gemstone in a gypsy setting by first undercutting a bearing. Students use special burs to set and oval stone in a six prong peg setting. Demonstration and students "bright cut" design (reverse star and round brilliant cut). They cut a reverse seat and do reverse bead setting. Students undercut bearings, make "relief cuts", and set stone and dress prongs with graver. Instruction is given on the vector method of tightening. Students use a combination of special burs when undercutting bearings to match the gemstone. Several methods of undercutting a bearing for a baguette stone are explained and practiced by the students. Students layout a design, hand cut wedges and bright cut the panels. The diamond looks like it is floating above the surface and reflecting from the panels. Students make azured cuts with gravers and special burs used on rings, Excellent setting for a reversible pendant plus it lightens the weight of platinum pendants to make them easier to wear. Students undercut bearings, make relief cuts, set stone and dress v prongs. Students will learn another method to tighten princess cut stones. Students layout a design using small gemstones to cover the surface. Special techniques are taught for making decorative beads, the most popular form of pave setting. Students layout a seven stone cluster with star bright cuts. This is a very attractive setting in a ring or pendant. Students layout, shellac up article and use special burs to cut away all the metal between the stones so that you see no metal with the surface completely covered with diamonds. Students layout a thread design with proper spacing and a variety of "Diamond Cuts". Demonstration given on 2 bead, 4 bead and 5 bead thread designs. This is excellent for diamonds set in initials and borders. An extremely helpful method in designing jewelry by holding many small settings together for soldering is explained and demonstrated. Excellent for filigree repair and soldering settings to a foundation ring shank, plus designing and soldering together a cocktail ring. Students set a Trillion stone in a mounting and dress prongs with Engraver.